Andrzej Pienczykowski - Haig Barrett, Inc.
Andrzej Pienczykowski is an accomplished technology executive experienced in setting and driving technology as well as business strategy. 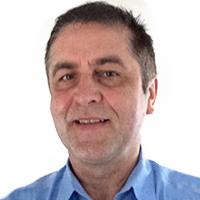 Andrzej is also a thought leader in knowledge management, business intelligence and electronic publishing with a specific focus on content management systems. From operational perspective he possesses an expertise in maximizing return on technology investment, leading and directing teams, application and infrastructure architectures designed for performance. Andrzej spent number of years at Gartner and he was critical to turning this research organization from paper to electronic publishing and electronic research delivery to their clients. This change enabled Gartner to grow its business from $ 150 million to $ 1 billion. He also served as a CTO of number software companies among others delivering and managing Learning Management Software platform. His expertise in knowledge transfer technologies was critical to delivering learning product to the market and strategic clients that included Toyota, Whirlpool, Black & Decker, Raymond James and many others. Andrzej was also responsible for building knowledge management and content delivery platform used by pharmaceutical clients that was saving them about $500 million in drug market launch phase by accelerating product uptake by 6 months. Clients of this platform included Johnson & Johnson, Wyeth, Abbott, Boehringer Ingelheim and many others. Currently Andrzej runs a web software development company successfully developing commercial products for its clients as well as develops and operates its own product. Andrzej holds Masters Degree in Mathematical Physics of Elementary Particles from Maria Curie-Sklodowska University.